Description: A venerable SD40-2 leads the way southbound through Queensgate. Description: CSX C40-8W 7720 leads Q573 (Cincinnati Oh. to Nashville Tn.) through Gaithers. 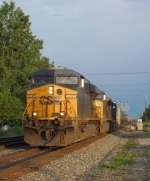 Description: CSX Q161 heads west past the B&O station in Fostoria. A set of clear signals is lined up for Q118, coming the opposite direction.